I am a busy lady. I love a clean home, but between this blog, photography, family, housework, homeschooling… I am NOT superwoman. Something had to give. So I decided my kids would do their own laundry. My boys are 6 and 4… my 2-year-old daughter is off the hook for now. 😉 I started this at the beginning of the summer, and I wanted to get through the whole summer – to the point where they truly had this routine mastered – before I shared with you all. So today, I’ve got two lists for you: why I think it’s a great idea to start them young and exactly how we do it. Most of their clothes eventually get ruined anyway. Several friends who heard about what we’re doing have expressed concern about treating stains, etc. With two boys so close together, I obviously try to preserve and pass clothes down… but the reality is that not many pieces make it through one or two boys no matter how much stain treatment they receive. I think we do our children a disservice when we do everything. They need to know that life takes hard work and that joy can be found even when doing said hard work. I also know that I am a more loving and patient mother when I’m not feeling guilty for the piles of laundry or dirty dishes I haven’t finished yet. It’s a win-win. It is a very do-able, tangible way for them to contribute to the family. Plus, it’s their own clothes! It teaches me (mom) to give up control. We could all use a little of this lesson from time to time, right? Trust me when I say that – compared to some other options – this is a fairly painless way to learn. Pick a day of the week for each kid. Give each kid their own laundry basket or hamper in his/her room. All dirty clothes go in that basket throughout the week. 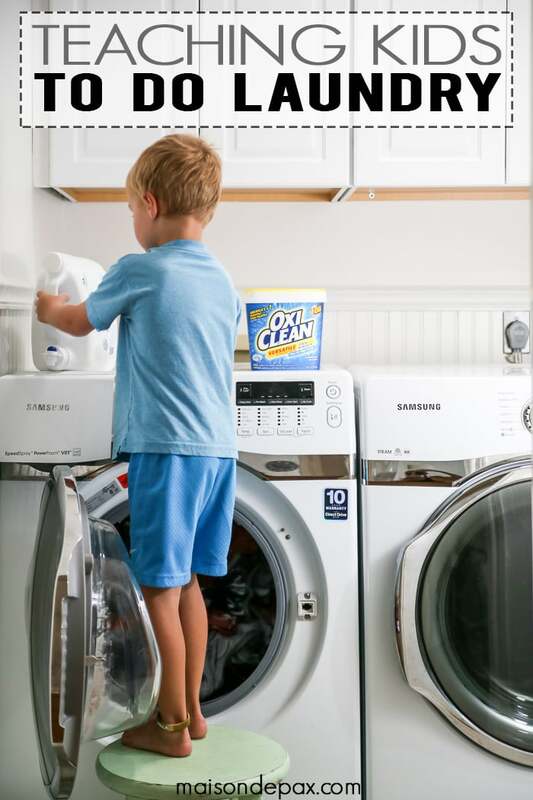 Anything with major stains (that mom notices), get dropped in the laundry room for mom to deal with. If it’s a major stain, I treat it and wash it right away (I’m still washing mine and Mr. Pax’s anyway). If it’s something minor, I spray it and throw it back in their hamper. Plan to spend extra time for at least a month as you train them to do their laundry. Talk them through each step as they do it, but do not do any of it for them. Keep a stool in your laundry room. We have front loaders that sit on the floor, so my kids don’t need the stool to load, but my 4 year old still needs it to see when the soap dispenser is full. Teach your children how to work the washing machine. 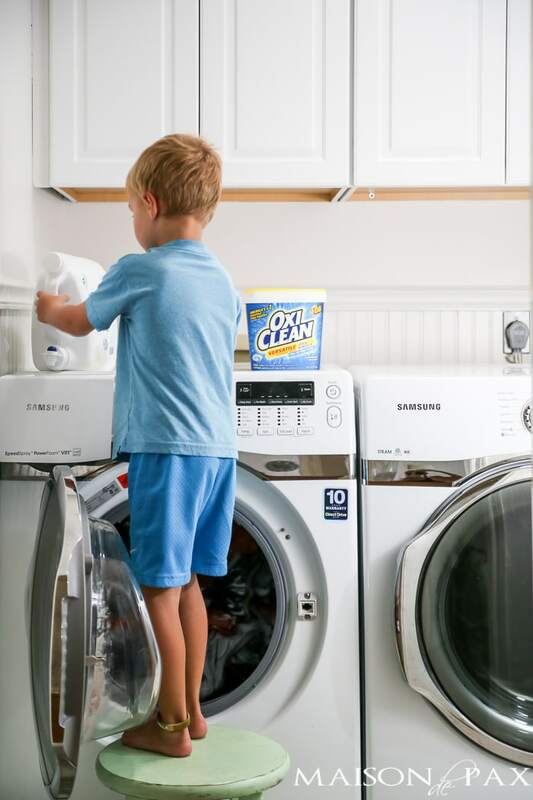 Show them how to get all the clothes out of the washer (even the ones stuck to the side!). Teach them how to empty the lint trap before they start the dryer. Teach your children how to work the dryer: run it all on normal. Tip: I prefer a laundry basket to a hamper so the same basket can be used to collect clothes from the dryer, fold them, and carry them to the closet to be put away. Plan to fold clothes with your children for at least a month as you train them to fold. 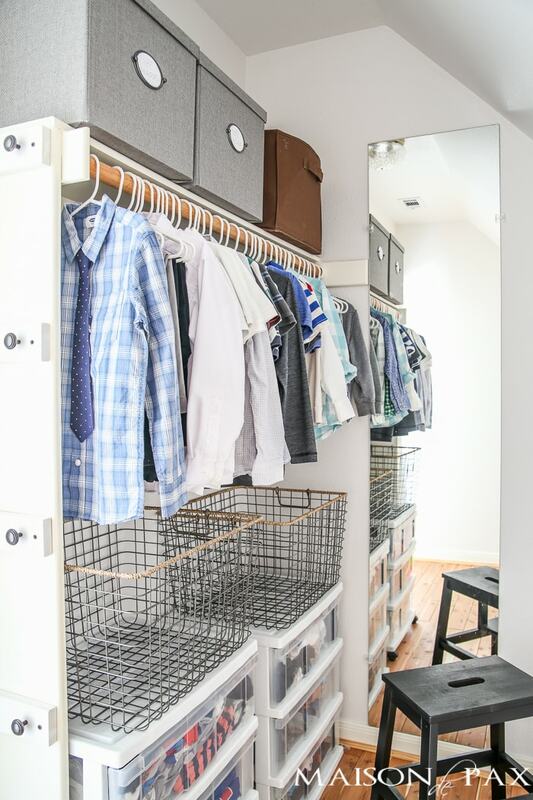 Make sure they have drawers or shelves that make it easy for them to put their clothes away. and easy to open and close. plastic drawers: little drawers like these meet all those requirements listed above; they’re perfect for inside a closet if you have the space. laundry basket on the drawers (I found these at Target): this keeps it all together… when they’re finished putting their clothes away, they just put it back on top to be their hamper. 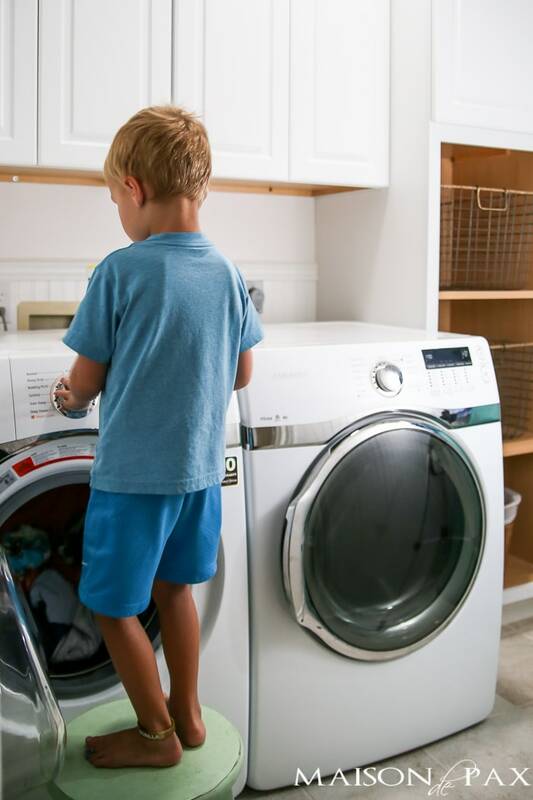 laundry baskets that are low enough to fit under the doors to the washer and dryer (if you have front loaders) make it easy for the kids to shovel clothes in and out of the basket into the machines. And I hope you find it helpful in your home! 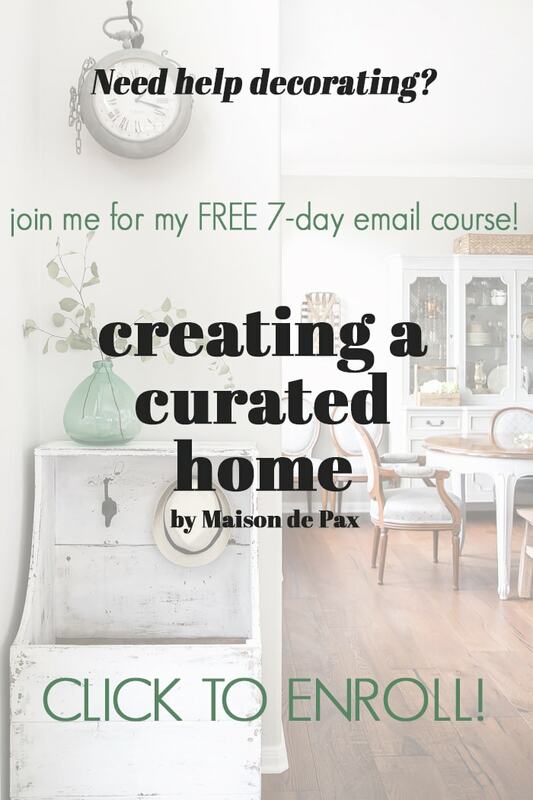 Speaking of decorating, though, if you want even more tips, advice, and encouragement, be sure you check out my new FREE decorating e-course. I love hearing about this, good job, Rachel! I totally agree with not handi-capping our children by doing everything for them until they get to college. And this kind of information directly contributes to a more beautiful home, as well. You are so sweet, Sarah, thank you!! I cannot tell you how much I appreciate your encouragement, friend. Hooray for you!!! I agree with all your reasons and would like to add how much THEY will appreciate their own skills one day AND how much the women in their lives will appreciate your efforts. I, for one, love a man who’s not just a pretty face around the house. Love your blog on so many levels. Wow, this is sort of mind-blowing. I thought this was years away for us, but the fact that your four-year old can do it gives me hope! I’m inspired! Thanks, Rachel!! Very neat! My 6 and 4 year olds put away their clean socks and underwear, but it never occurred to me to have them do the whole process.